Reactions to the Supreme Court ruling in Brown v. Board of Education made 1954 a watershed year for the African American civil rights movement. Brown v. Board of Education was the name given to five separate cases concerning the issue of segregation in public schools. This decision overturned the “separate but equal” standard that was set by the 1896 Plessy v. Ferguson Supreme Court ruling that allowed discrimination against African Americans in social and political life. It was not that I was just fed up in December 1955. I'd been fed up my whole life, as far back as I can remember, with being treated as less than a free person. A new wave of African American activism swept the country. At times, national and regional organizations like the National Association for the Advancement of Colored People (NAACP) or the Southern Christian Leadership Conference (SCLC) coordinated their efforts. In other cases, African Americans and their allies fought local battles against “Jim Crow” laws that forced the separation of Black and white citizens in public spaces. These actions included “sit-ins” at restaurants and voter registration drives. Like others before her, Rosa Parks refused to comply with segregation laws that required her to give up her seat to a white man and move to the back of a Montgomery, Alabama bus. Parks’ boycott was a strategically planned action several years in the making. In other words, her act of civil disobedience was not spontaneous; Parks was a secretary of a city chapter of the NAACP, the organization behind the action. The boycott that followed immediately and lasted for a year was organized by the NAACP with the patience to “wait until the time was ripe and the people were ready”, and was led by Dr. Martin Luther King, Jr. The boycott ended with success when the Supreme Court ruled bus segregation unconstitutional. 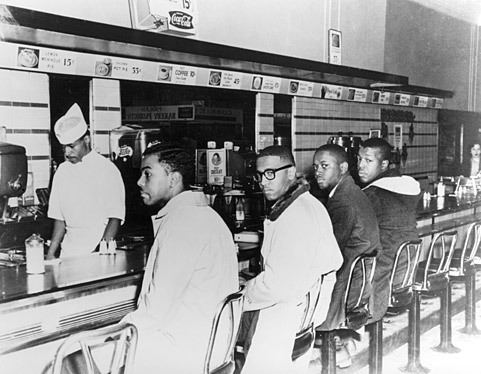 In 1960, four Black college students - Joseph McNeil, Franklin McCain, Ezell Blair Jr. and David Richmond - organized a sit-in to integrate a Woolworth’s lunch counter in Greensboro, North Carolina. When asked to leave, they remained seated, politely attempting to order. Their strategy echoed the nonviolent protest philosophies promoted by the mainstream civil rights organizations. The protest continued over the next few days, inspiring a turnout of hundreds of students. Like the bus boycott, it was successful, and Woolworth’s was forced to desegregate due to severe economic pressure. The Woolworth’s sit-in was a catalyst for waves of similar independent, grassroots protests across the country - generating media attention and support for the cause. In 1961, the Congress of Racial Equality (CORE) began to organize Freedom Rides throughout the South to protest segregation in interstate bus terminals by integrating “white only” restrooms, lunch counters, and waiting areas. Their efforts were met with resistance and violence, but also brought increased national and international attention to the civil rights cause. The 1963 March on Washington for Jobs and Freedom, a peaceful protest that called for civil and economic rights for African Americans, was a turning point in the struggle for civil rights. Martin Luther King Jr.’s “I Have a Dream” speech was a stirring call for social and political justice for African Americans. More than 250,000 people participated in the march, which motivated Black people and their allies to push for the passage of the 1964 Civil Rights Act.